The following morning, A left early for his meetings and I did “la grasse-matinée” which just means I laid around in bed until around ten. When I went downstairs to check out, I found out that there were no taxis available because of a grève de transport (transport strike) meaning NO taxis, NO metro and NO buses so I called my friend Daria to let her know I was going to get to her on foot. Luckily, she was already in St. Germain doing errands and agreed to meet me nearby so we could walk to her home in the 5th arrondissement together. Checked out of the hotel and took my luggage around the corner to Le Nemrod for a late-morning café crème and croissant (the last one they had as it was nearing noon). It was a beautiful day and the sun was out so I enjoyed my terrace table and the people-watching it afforded. Daria arrived later with her youngest son, 14 month-old Winslow strapped in his buggy and we slowly made our way back down the boulevard St. Germain to her apartment just off the Maubert-Mutualité metro station. It was about 20 blocks from my hotel but a pleasant walk since we took our time, chatting and catching up on news since we last saw each other in 2005. We dropped the bags and the baby at her place then rushed over to the thrice weekly marché Maubert (Tuesdays, Thursdays and Saturdays) on the square to get some food for an impromptu lunch she had organized with her husband and a film editor friend, Marie. 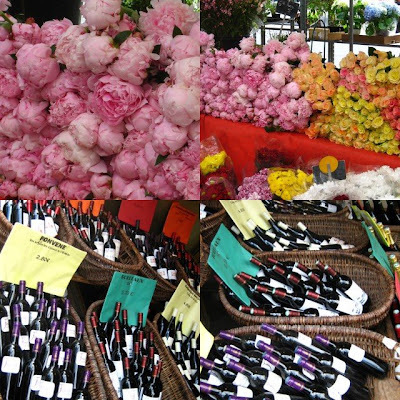 Scenes from the Marche MAubert – large-droopy headed pink peonies (my favourite flower) and wicker baskets of wines. 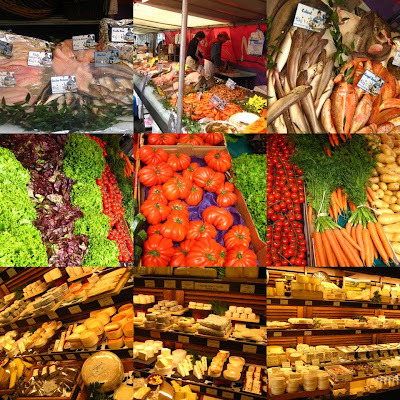 The market was an assault on the senses with the beautifully-displayed fresh produce, cheeses, flowers, meat – I was so overwhelmed that at first, I couldn’t help her choose what to buy. Since we didn’t have much time, we decided to get some cooked Mexican-spiced pork spare ribs from the butcher. Along with the ribs, we also got a large container of potatoes and bacon roasted directly in the rotisserie underneath the whole chickens, browning the potatoes in the hot chicken fat. We got a baguette a la campagne and the most exotic fruit tart we could find on the shelf at the patisserie – not the typical tarte aux pommes or tarte aux poires but a tarte aux pommes, abricots, pistaches et amandes. Two kinds of leafy lettuce, a few avocados and last but not least, two wonderful cheeses – a creamy Reblochon and a herbes de Provence coated chèvre. We loaded Daria’s red Rolser with our goodies and walked the half a block home to set up our lunch. Marie was already there and she helped make the salad while Daria set the table and I laid out the food on platters. In ten minutes we were ready to eat and what a feast we had. The ribs were delicious and the potatoes were decadent. The salad of lettuce, avocados and mustardy French dressing was just right. When we got to the cheeses, I was about to follow the “no unpasteurized milk products rule while pregnant” but I couldn’t help myself so I had a small slice each of the Reblochon and the Chèvre – both were excellent and I had to control myself from having seconds. Finally, we each had a small slice of the exotic fruit tart that was interesting – not too sweet with the nuts adding texture to the flavours. After lunch, we walked around the corner to a little café overlooking Notre Dame and the Seine and each had an espresso. For me, this is what Paris is all about – the vie du quartier with each arrondissement’s weekly market, fantastic produce accessible and available at all times and most of all, the time to sit around at one of the innumerable corner cafés and watch the world go by. 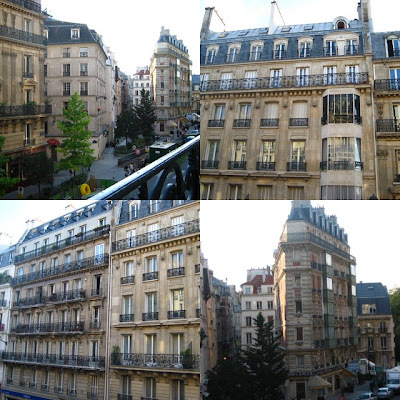 Views from Daria’s 17-meter balcony of typical Parisian facades. We spent the rest of the afternoon with the three kids – pick-up at school then the short walk to the sandbox at Notre Dame before heading home to feed the kids and put then in bed. We then had an early dinner of Mexican takeaway from nearby Mexi and Co. then ended our busy day sitting on Daria’s typical Parisian wrought-iron balcony having a coffee. Thanks! The light in Paris is special so the buildings always look amazing and the market – well, with so much fresh produce the colours are all-natural.G.T. Loved the food photos..such vibrant colours and the Parisian buildings.